keep the oil cooler, extending the life of the hydraulic system. Frame cross tubes supporting the hydraulic cylinders have 3/8" (.375 mm) wall thickness. 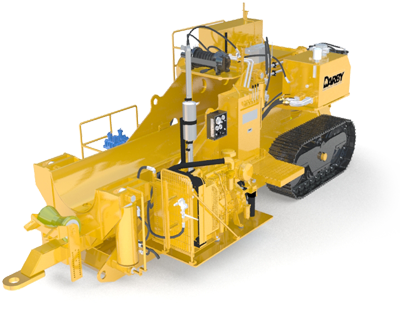 370 Quincy air compresor is hydraulically driven by its own circuit. Maximum bending force at front of stiffback is 381,700 lbs (173,139 kg). Air compressor provides 240 psi (16.5 bar) for mandrel operation. With engine running at 2,200 rpm, hydraulic vane pump produces 41 GPM (155 LPM) @ operating pressure. 15 ton CAT style triple grouser tracks.